I got started on Tumblr a few months ago (I'm shaylynnann over there), and I've joined the Tolkien Read-Along event, in which a bunch of Tolkien fans got together and are reading The Silmarillion together. (For those not nerdy enough to know what The Silmarillion is, it is basically the history and mythology of the world that The Lord of the Rings is set in. It's fantastic but something of a difficult read-- it's not a novel!). On Sunday I had the rare luxury of free time with nothing to do and nothing hanging over my head, shouting deadlines in my ear. I spent the afternoon and evening drawing, inking, and painting this picture! 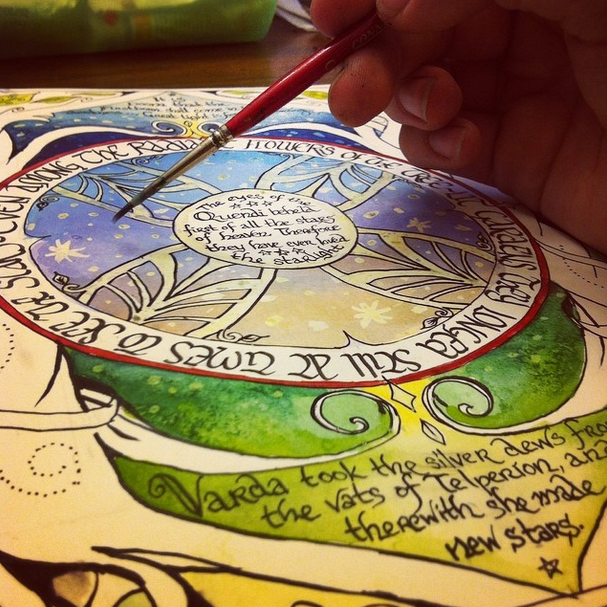 It is inspired by the Elves and their love of the stars, and features four quotes from the chapters The Silmarillion that we are covering in this week's readalong. For lack of a better name, I am calling this The Love of Starlight. Click "READ MORE" to see the rest of this post-- behind the scene of the artwork, and an explanation of what is going on in the picture. This is WOYWW #270 (and the third time I've participated) and if you want to see the workdesks of other artists and crafters, check out the linky here! My workdesk this week is once again the dining room table. 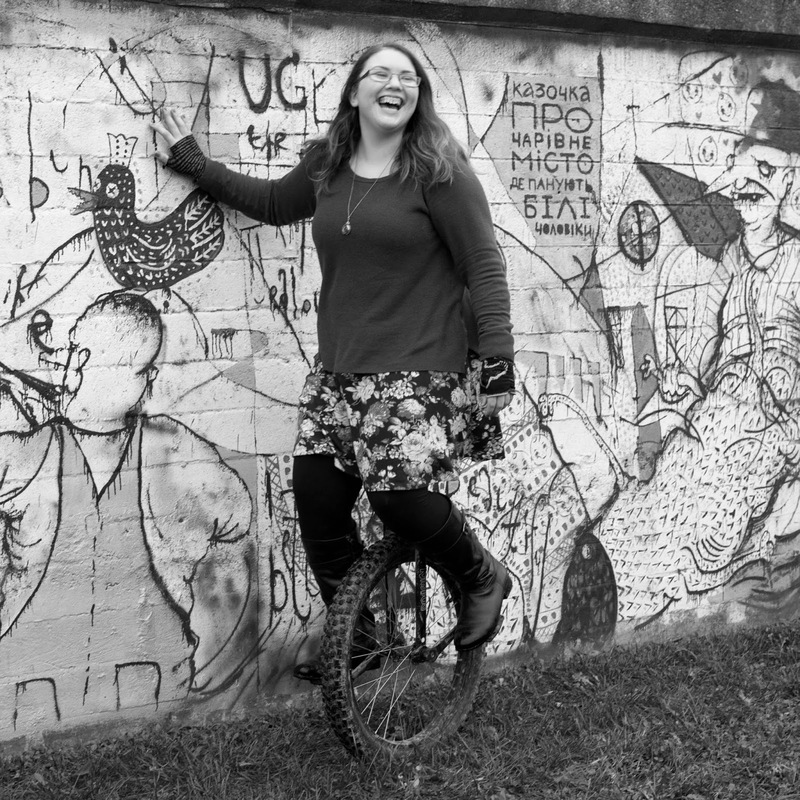 Last week, I was making new graphics for my blog and editing photos. I've still been doing that, but a couple days ago I had some beautiful free-time to spend painting. Whoah, Instagram pictures look weird when they aren't two inches big on your phone! 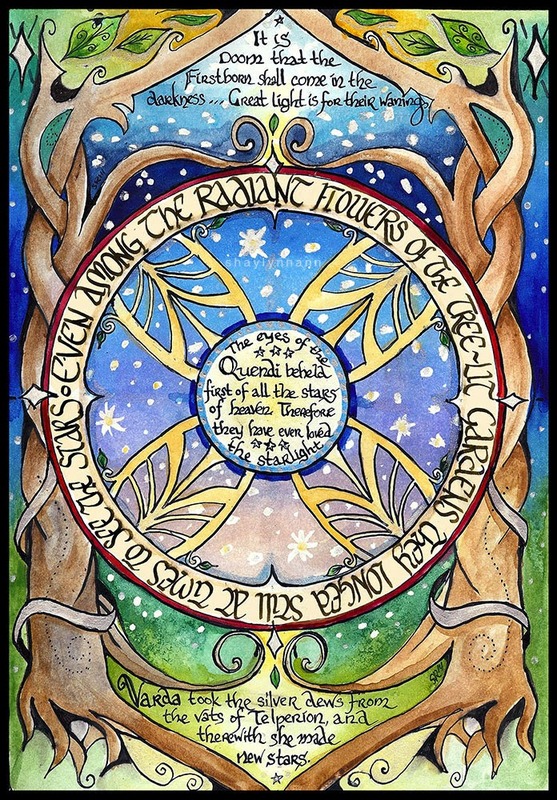 The painting is an illuminated-style illustration of some quotes in The Silmarillion (the history and mythology of the world that The Lord of the Rings takes place in). The whole theme of the piece is about how much the Elves love starlight. I've haven't only painted this week, but I haven't been as productive as I want. I'm actually writing this post on Tuesday night because all of tomorrow (Wednesday) is going to be spent in the studio. Tomorrow is my last full day to spend in the studio before I leave for school. I'm excited for another year at college but so sad that my summer is nearly over. I've been busy, and also took two summer courses, and time really flies. Anyway, my point was that as of Tuesday I don't have a picture of my real workdesk. I'll try to update this post with a snapshot at the end of the day on Wednesday. 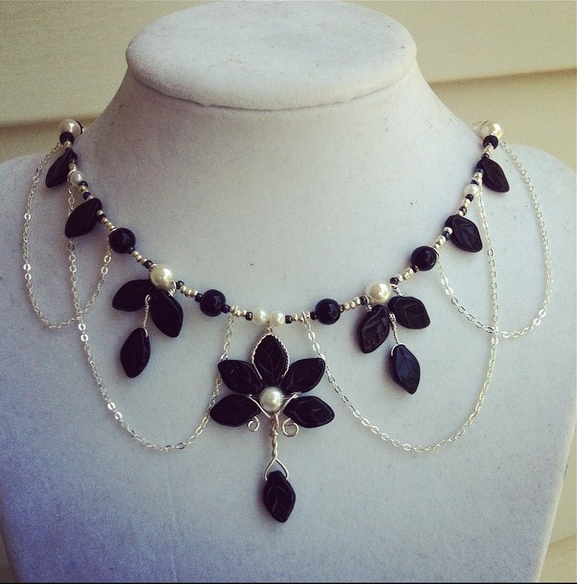 But I do have a picture of a piece of jewelry that I made for someone who wanted a black-and-white medieval-style necklace featuring the Evenstar pendant. She is doing a cosplay of Lyanna Stark from Game of Thrones. I really enjoyed making this necklace-- I just kicked back and listened to Goose Girl by Shannon Hale (fantastic YA fantasy novel to listen to, it was interesting and didn't require much concentration) and played with beads and wire for a couple hours. So... This has been a peek into what I've been working on since last Workdesk Wednesday. I'm looking forward to glancing at everyone else's blog and seeing their workspaces later this week! 1) This photoshoot was with family. 2) My family is crazy. 3) Sometimes my family look as crazy and goofy as they are. 4) The only thing that can cheer one up better than goofy, smiling people in fairytale costumes is grumpy cats doing cute things. My mom is allergic to cats. We've never had a pet. I don't have cute cat pictures to share. But I do have cute, crazy pictures of my cute, crazy cousins and aunts. Click "READ MORE" to see the other pictures. My little sister "Rosie" helped me create a fashio video featuring my jewelry. She designed all of the outfits and picked out the jewelry herself! She also chose the song. The video is under four minutes long; please check it out! Not only is it stinkin' cute, but if you've been eyeing anything in my Shoppe it's always nice to see it "in action" on someone. But, mostly, watch because Rose is stinkin' cute!